The current FAE (Fantasy Artists of Etsy) Street Team contest is of the theme "Snowflake Fantasy". I knew I wanted to create an ACEO with my dragonlings, but what exactly...? So I thought and thought and came up with MY snowflake fantasy. 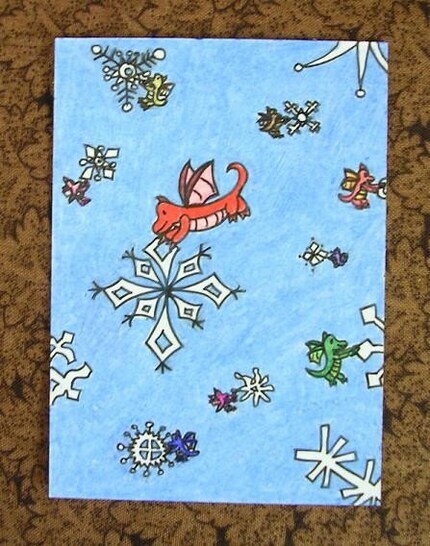 "Small dragonlings carefully guide each snowflake to its designated spot in the sky so that it will fall "just so" and at exactly the right time. This ACEO is my own interpretation of the magic in the ordinary." The contest ends at the beginning of December, and I will be sure to update you all once voting starts. Each contest sees amazing work from all of our team members and I'm sure this one will be no different. That ACEO is SO CUTE! !